[PDF] Operations Management (7th Edition) | Free eBooks Download - EBOOKEE! Description: Were you looking for the book with access to MyOMLab? This product is the book alone, and does NOT come with access to MyOMLab. Buy Operations Management with MyOMLab access card 7e (ISBN 9780273776291) if you need access to the MyLab as well, and save money on this brilliant resource. Operations management is important, exciting, challenging â€¦ and everywhere you look! â€¢ Important, because it enables organisations to provide services and products that we all need â€¢ Exciting, because it is central to constant changes in customer preference, networks of supply and demand, and developments in technology â€¢ Challenging, because solutions must be must be financially sound, resource- efficient, as well as environmentally and socially responsible â€¢ And everywhere, because in our daily lives, whether at work or at home, we all experience and manage processes and operations. 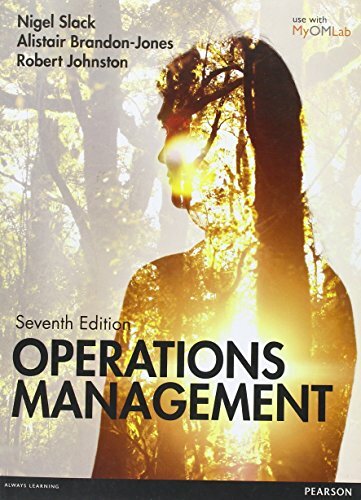 â€˜Operations Managementâ€™ focuses on the sustainable and socially responsible imperatives of operations management, using over 120 cases and illustrations of real-life operations around the world, including Apple, Medecins Sans Frontieres, Amazon, Ecover, Dyson, Disneyland Paris, Google, The North Face, and many more. No comments for "[PDF] Operations Management (7th Edition)".